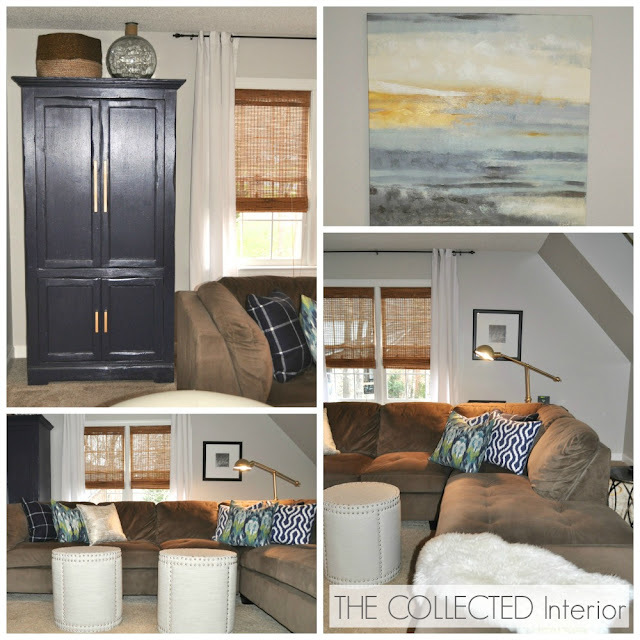 The Collected Interior: An Upstairs Family Room Transformation - and new ottomans from Decor Market! An Upstairs Family Room Transformation - and new ottomans from Decor Market! 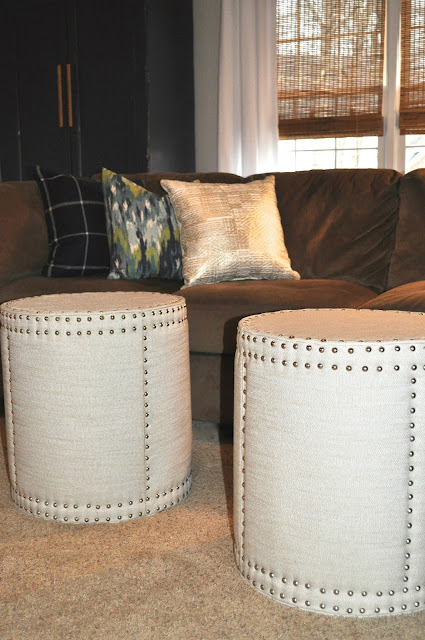 Hey guys, so the awesome people from Decor Market sent me two Safavieh ottomans a few weeks ago and I love them! 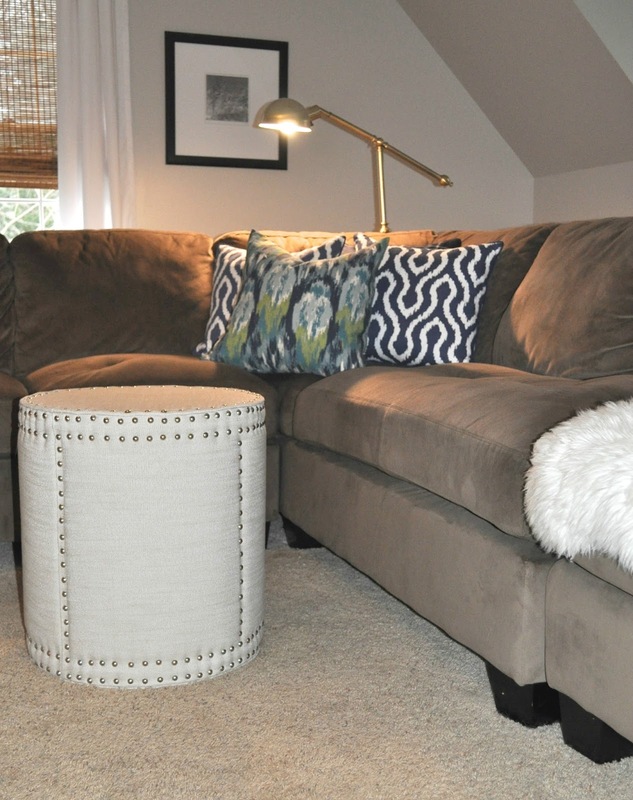 They are the Paula Ottomans and are perfect in our upstairs family room - bonus room. This is an older picture below of where this room began several years ago. Yes very warm and 1990's with the maroon and gold colors. Here are the new ottomans! We use them for extra seating, or to put our feet up when watching movies. We'll set drinks or popcorn here, they seriously are so versatile! And stylish too with light gray linen and silver nail head trim. So in addition to the ottomans, today I thought I'd share the deets on the rest of this room's transformation. I scored this affordable wall art from World Market a few months ago and love how it ties in so well with the rooms color scheme. And abstract art with nature themes are my favorite style art. This one reminds me of a warm sunny day at the beach. 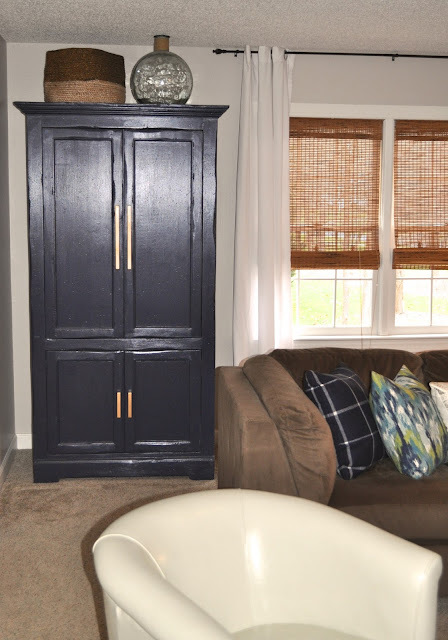 Here's my Diy painted armoire. The color is Benjamin Moore's - Hale Navy. And the gold pulls are from Ikea. This piece was painted a few years ago, and to this day I still can't believe the transformation. The blue/green pillows are custom from Etsy. The navy and white patterned pillows are from Hobby Lobby. And the two navy buffalo check I scored from Target a few weeks ago on clearance. I love mixing patterns for added interest and texture! And here are my Awesome new ottomans! Now we have so much seating in this space. And they create symmetry in the room, I love that! 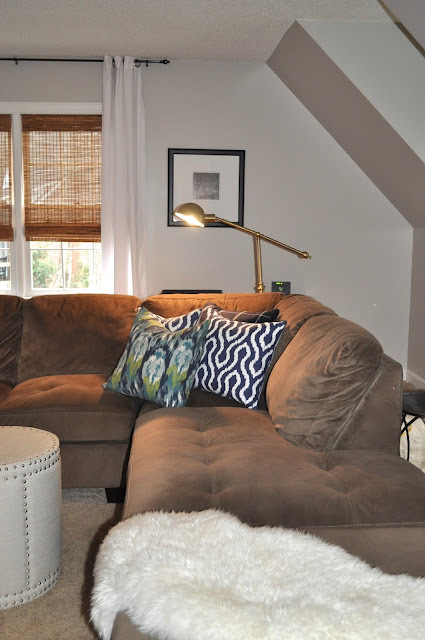 Okay guys that is the scoop on our new ottomans from Decor Market, and our upstairs family room - bonus room transformation! So instead of using a standard coffee table, consider using ottomans! With style, versatility and function...they are a great choice. *This post is sponsored by Decor Market, however the opinions and text are one hundred percent mine. I love the look of the ottomans! 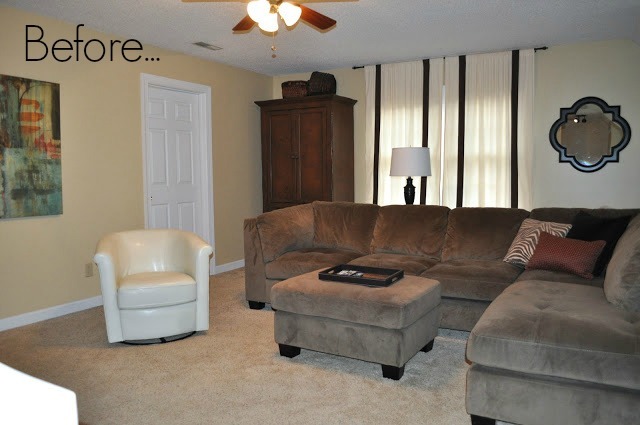 The other pops of color really transform the space! Thank you for sharing with us this week at Brag About It! Pinned and tweeted to share. Thanks Laurie for hosting a great party!